Having a mobile moment? You’re in good company. Mobile moments are situations where we turn to our phones for immediate access to something we need – information, weather reports, and increasingly, nearby retail stores. In fact, 69% of us turn to mobile search first in a moment of need. Even in this ever-changing digital landscape, 90% of today’s shoppers are still buying in-store. According to Forrester Research, 2016 saw mobile influence $1.05 trillion in offline sales. Moreover, 52% of consumers compare prices, 47% look up product information, and 32% seek out stores near them – all over mobile. So when it comes to driving in-store outcomes, mobile should be one of the first strategies you look to in 2017 and the years to come. At the same time, mobile phones are different than desktop computers in their access to GPS or Wi-Fi powered location data. Marketers understand all of this, which explains the proliferation of mobile ad campaigns that use location-based targeting. 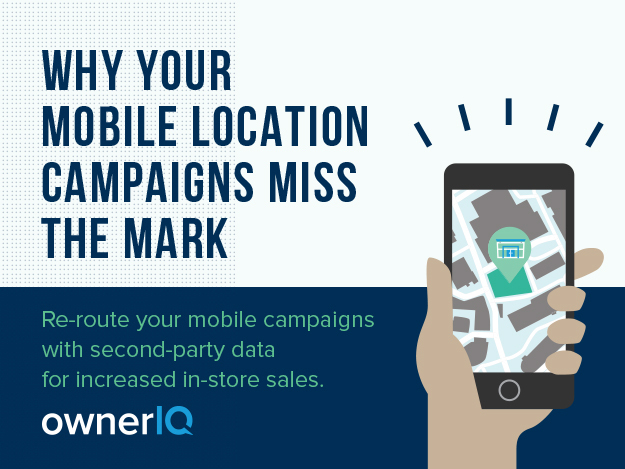 Access ownerIQ’s new eGuide, Why Your Mobile Location Campaigns Miss the Mark, to explore the pitfalls of today’s mobile location-based campaigns. Learn why the next generation of ad targeting will combine the best of location and user-level mobile shopping behavior to maximize in-store outcomes.